This post is sponsored by Ontario Apple Growers, who I love for their apples that are fresh and crunchy all year long- even in February! Donut-y apple fritter goodness all baked up and sprinkled with cinnamon sugar. Yus puh-LEASE! I had a hankering for a donut-like treat- I think it’s something about the February blahs that makes me crave sweets even more than usual- but I had a bit a dilemma. I also wanted something not too bad for me because I have an upcoming trip to Jamaica, and this girl plans to have a 6 pack by then…or at least not a winter one pack. Plant power! So, I pulled some sneaky deaky tricks outta my sleeve to meet both qualifications. I took fresh sliced apple rings and dipped them in a simple homemade batter. 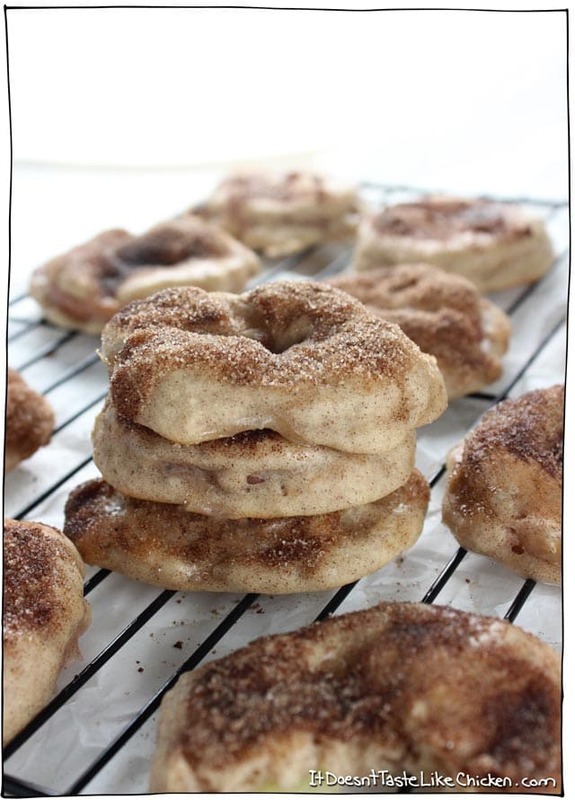 I baked them instead of fried then, then I lightly (ok heavily) sprinkled them with cinnamon sugar. 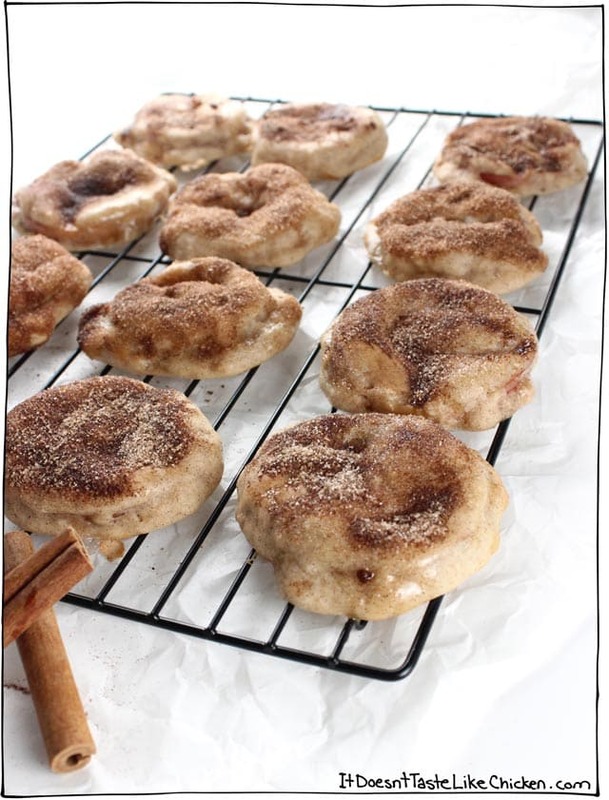 The result is a small apple stuffed cinnamon sugar fritter that are only 100 calories each! I was actually shocked when I calculated the nutrition. Now I don’t feel quite so guilty for immediately scarfing down 4 of them…whoops! These are so scrumptiously yummy served still warm from the oven. 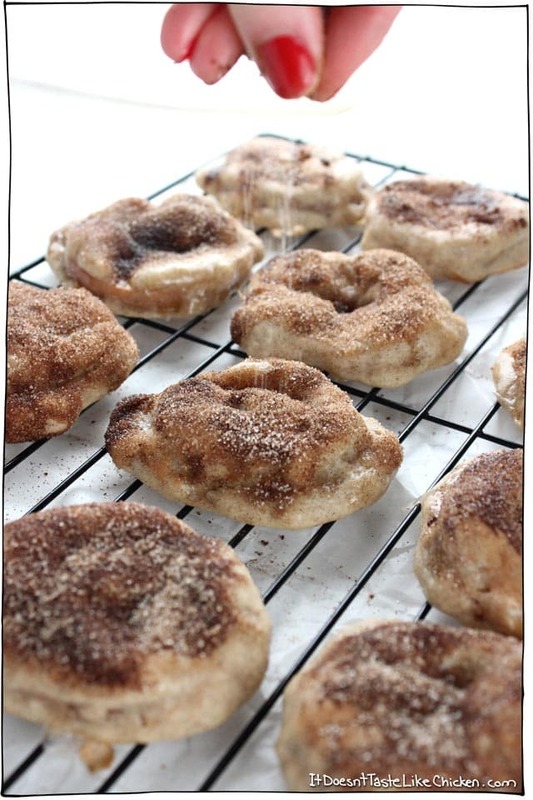 Soft, fluffy dough encasing a sweet apple center, then a cinnamon sugar topping just makes them! Wonderful served with coffee or tea. Omnomnom. 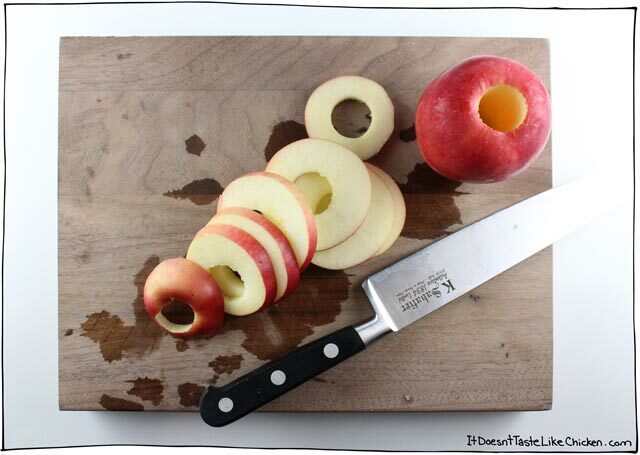 To make Vegan Baked Apple Cinnamon Fritters: Use an apple corer to core the apples, then slice the apples into 1/4″ thick rings. 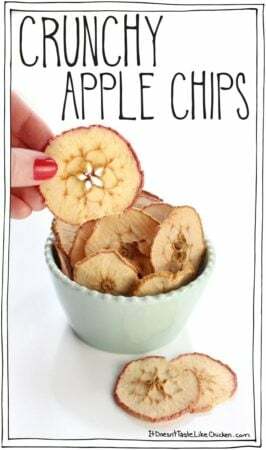 If you don’t have an apple corer, you could alternatively, slice the apples first, then use the tip of a knife, a small round cookie cutter, or a shot glass to cut the core out of each slice. 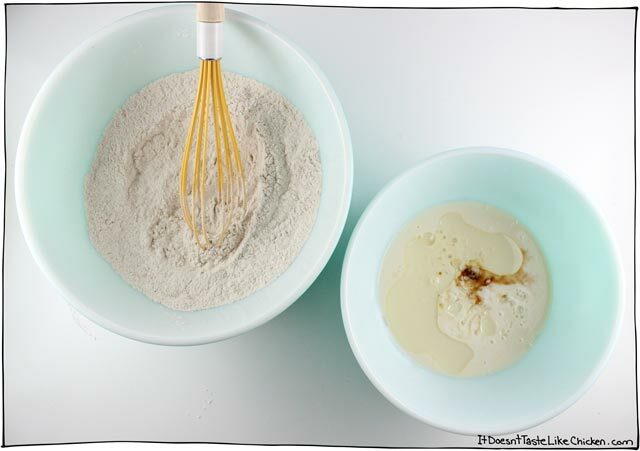 In a large bowl whisk together the dry ingredients. In a medium bowl, whisk together the wet ingredients. Pour wet into dry and combine until the batter just comes together. Don’t over-mix, lumps are totally cool. 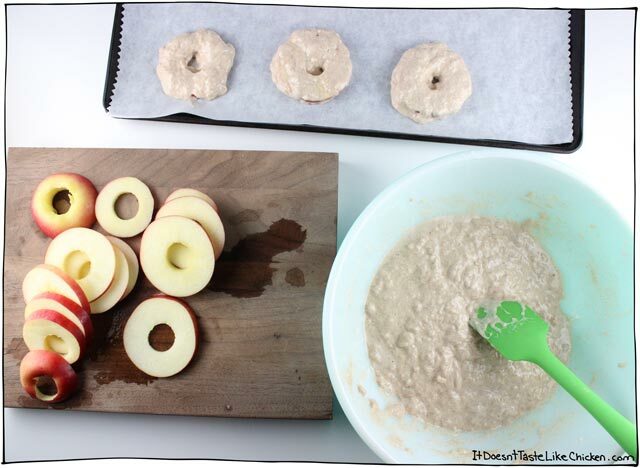 Take an apple ring, one at a time, and dunk it in the batter. You can use a spatula to help flip and coat. You want a nice thick coating of batter. This part will be messy! 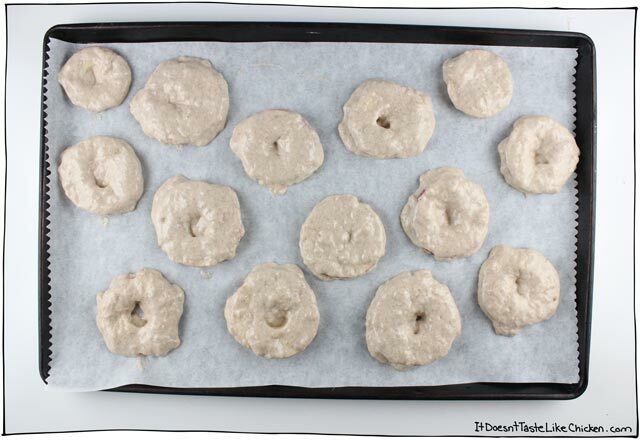 Then place the batter coated apple on a parchment lined baking sheet. Like so. Give them a bit of a room as they will grow. You may need two baking sheets. Bake for about 20 minutes until the batter is puffy and just begins to get golden. Let cool for 5 minutes before handling. They really won’t be the prettiest of things, but that’s where cinnamon sugar comes to the rescue! Melt the vegan butter, and then brush a little on the top of a fritter, then sprinkle generously with the cinnamon sugar mix. I love them best when still warm from the oven! They are still good the next day but not quite as good, so if you don’t think you will be able to devour them all fresh, feel free to half the recipe. A healthier dessert that's only 100 calories each! Preheat to 375F (190C). Line a baking sheet with parchment paper. You may need two sheets. In a large bowl whisk together the dry ingredients. In a medium bowl, whisk together 3/4 non-dairy milk with all the remaining wet ingredients (except for the apple slices). Pour wet into dry and combine until the batter just comes together. If your batter is too thick, add more non-dairy milk to reach a thick batter consitency, up to 1/2 cup more non-dairy milk. Don’t over mix, lumps are totally cool. 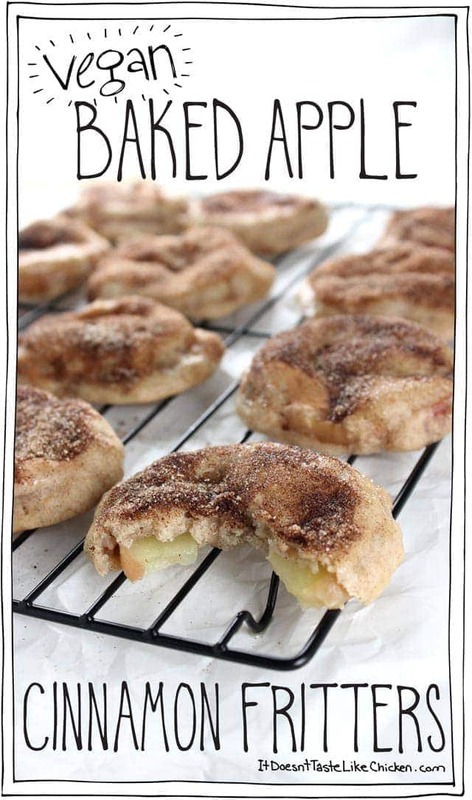 Take an apple ring, one at a time, and dunk it in the batter. You can use a spatula to help flip and coat. You want t a nice thick coating of batter. This part will be messy! 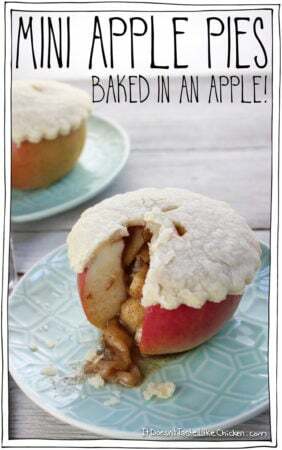 Then place the batter coated apple on a parchment lined baking sheet. Bake for 20 to 25 minutes until the batter is puffy and just begins to get golden. Let cool for 5 minutes before handling. 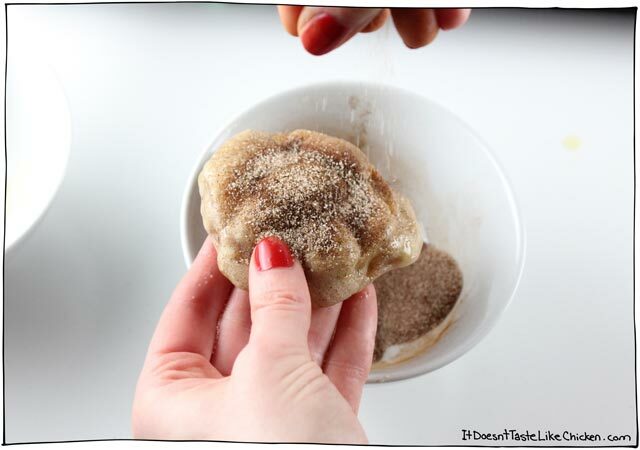 Mix together the sugar and cinnamon for the topping in a small bowl. Brush a little melted vegan butter on the top of a fritter, then sprinkle generously with the cinnamon sugar mix. Repeat with the remaining fritters. I love them best when still warm from the oven! Omnomnom. These were great! I used the full amount of milk and it was the perfect consistency. The only thing wrong was I would have preferred my apples thicker, but that was my fault not yours. I got my boyfriend to cut them and he went a bit on the thin side. A great fast pudding. Will definitely be making these again. I think the mistake is in the milk, it is 1¼ as in the ingredients or ¾ as in the instructions? Anyway, I made them and they were delicious! Yeah, I added that change to start out with less liquid and add more if needed so the recipe works for everyone. So happy you enjoyed them! So I made these tonight and we were very pleased. I’m pregnant and the baby wanted a warm apple dessert. I’m really lazy and I always decide to make dessert at the last minute and so this recipe seemed perfect. It’s the only fritter recipe that has baking instead of frying and I appreciate only having to slice the apples because peeling and chopping is too much work. 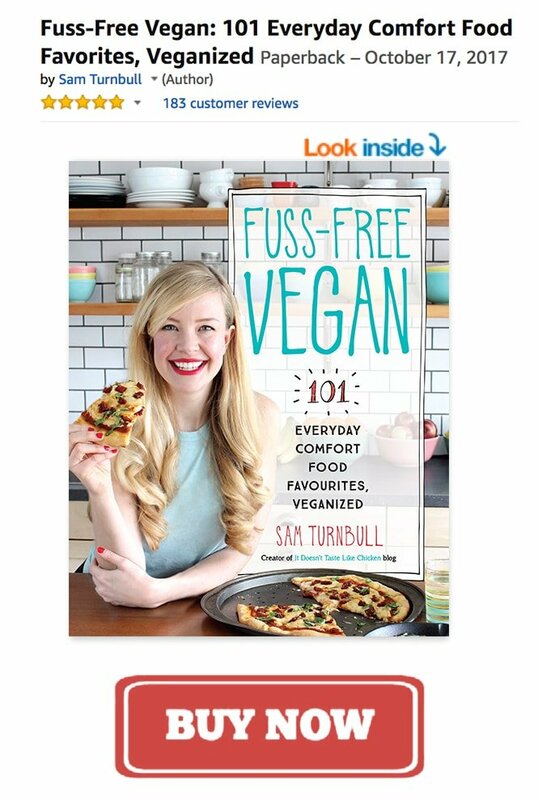 I read the reviews so I was very sceptical about it. I changed two things 1. I added the wet ing to the dry ing a little at a time until it was thick and sticky. I did not end up using all of the wet ing. 2. I baked them on a greased baking pan because I don’t have parchment paper. Once you put the apples on the pan the batter starts to slide off. 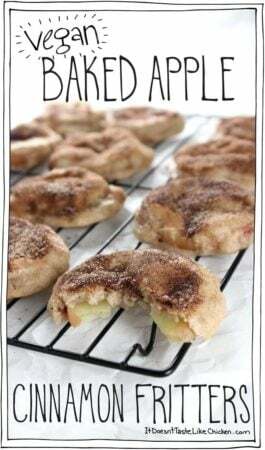 This worried me, but as it turns out plenty of batter stays on and that batter that slid off crisped up and became an awesome crunchy, buttery, cinnamon-sugary cookie that really complemented the soft apple. We made 3 apples worth and they are all gone! The baby in my belly is very happy! Thanks! I tried this recipe and the batter was super soupy. I tried to add more flour but saw it would have taken alot more than I was willing to use for two apples. So it ended up being sliced baked apples with sugar and cinnamon on top. They actually tasted bad so had to toss the whole thing. I thought maybe I wrote the recipe wrong but I had it right. Will reduce amount of liquids next time. Great idea though!! 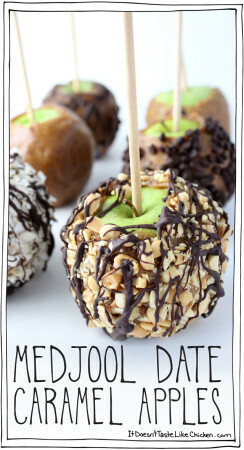 Baked apples anything is awesome! Thanks Sam! These were very good! 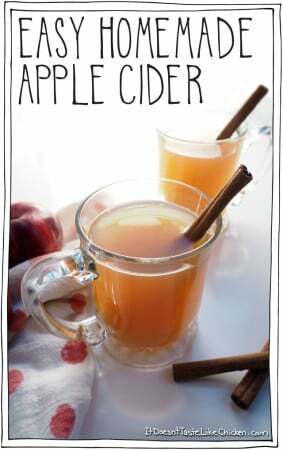 I only had granny smith apples on hand so I used those. My batter turned out a little more runny than in your picture. Could it be because instead of using 1-1/3 cups of all-purpose flour, I used 1 cup of AP flour and 1/3 of spelt flour? Also, thanks for the info about white sugar. 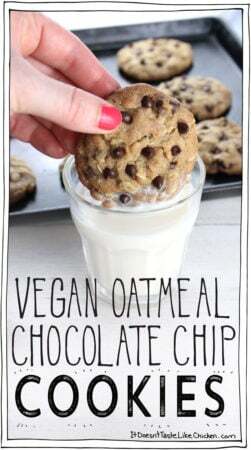 I didn’t know it might not be vegan (I used brown sugar). 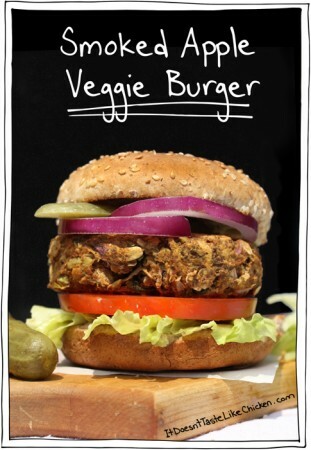 Hi Maria, So happy you enjoyed the recipe! I’m not familiar in baking with spelt, so possibly. Just a heads up, brown sugar is usually just white sugar with molasses added to it, so you might want to check the brand your using is vegan-friendly. So happy you are loving my blog! I know some people use applesauce in baking to replace oil, but I have not tried it myself with this recipe so I can not guarantee it will work. Hope that helps! Do you happen to know if using almond flour and coconut sugar instead of regular flour and sugar would yield the same results?? Thanks! I haven’t tried it myself, but from my research, you might need to add a little more baking powder to help the almond flour rise more, and the coconut sugar shouldn’t be a problem to swap. Hope that helps! Love your recipes, but a little confused when it comes to white sugar. Is there a vegan option available? Yes I was thinking the same thing. White sugar isn’t vegan. I will just substitute with vegan cane sugar. Sometimes bone char is used to whiten the sugar, but that is most common in the US, and not so much in other countries. You can check with the brands to make sure there is no bone char used. Redpath sugar (a common brand in Canada) is totally vegan. If you can’t find the info online, organic sugar is always vegan. Thank you, Sam. I know a lot of people get confused about that. I always swap out with another type of sweetener as in raw sugar, cane, organic brown, or coconut.